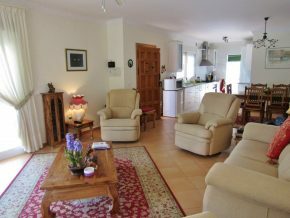 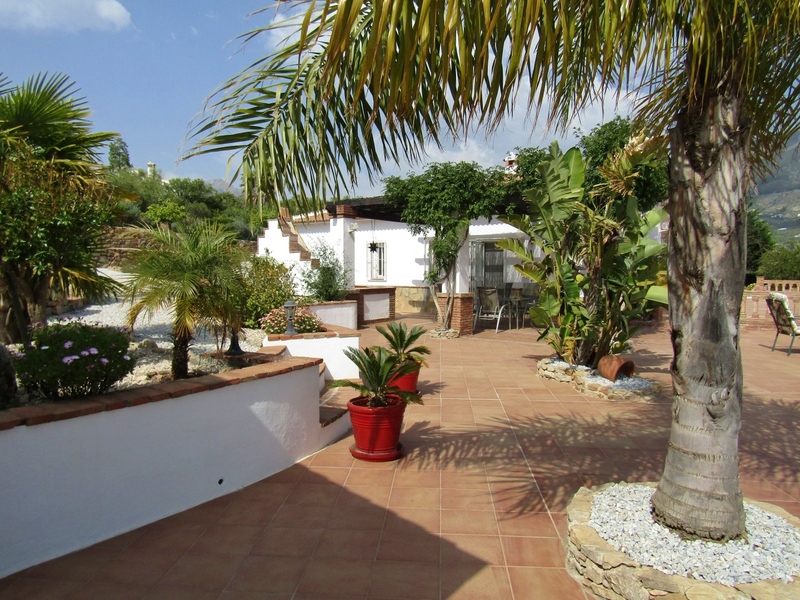 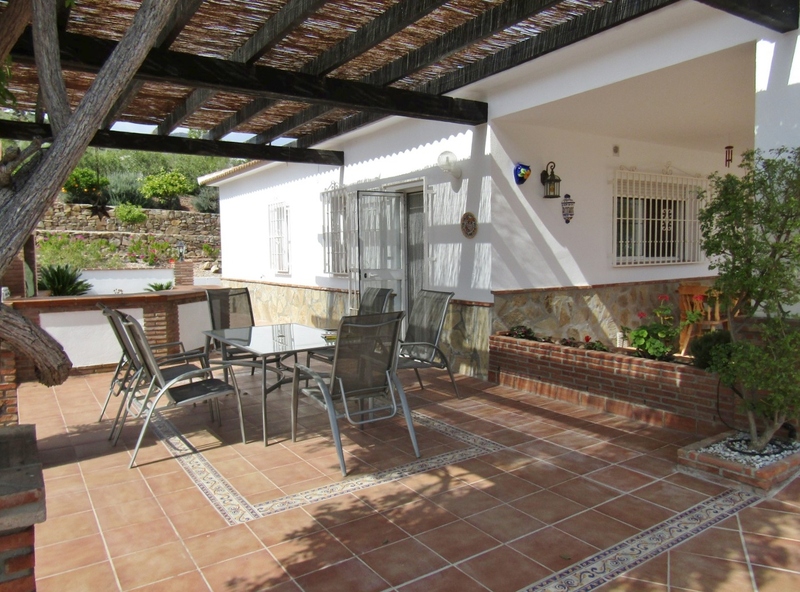 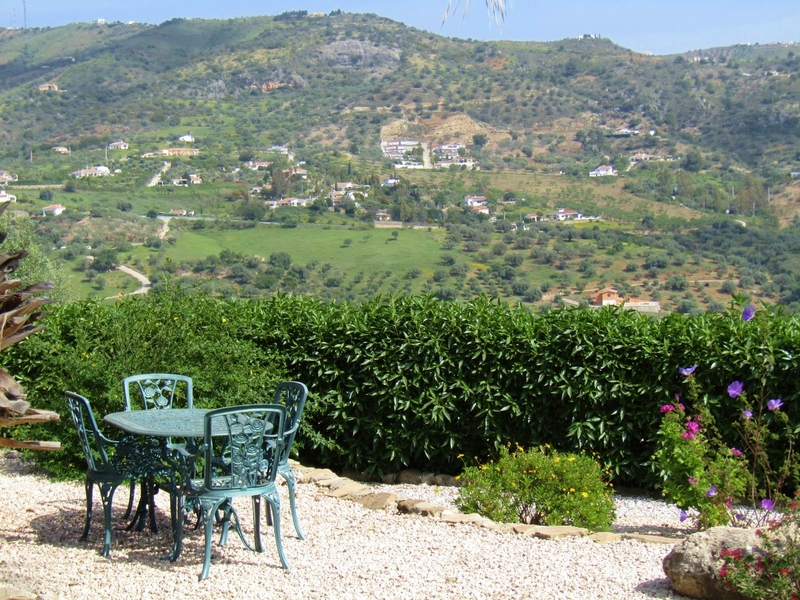 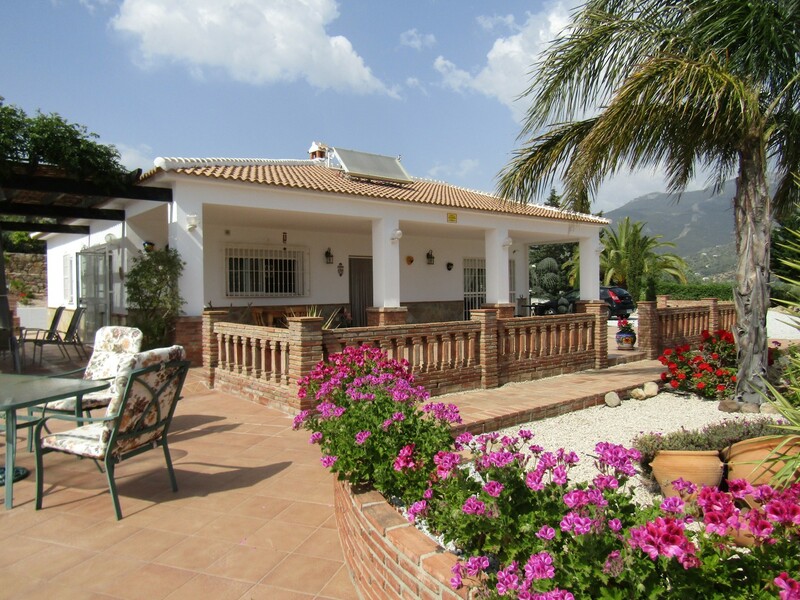 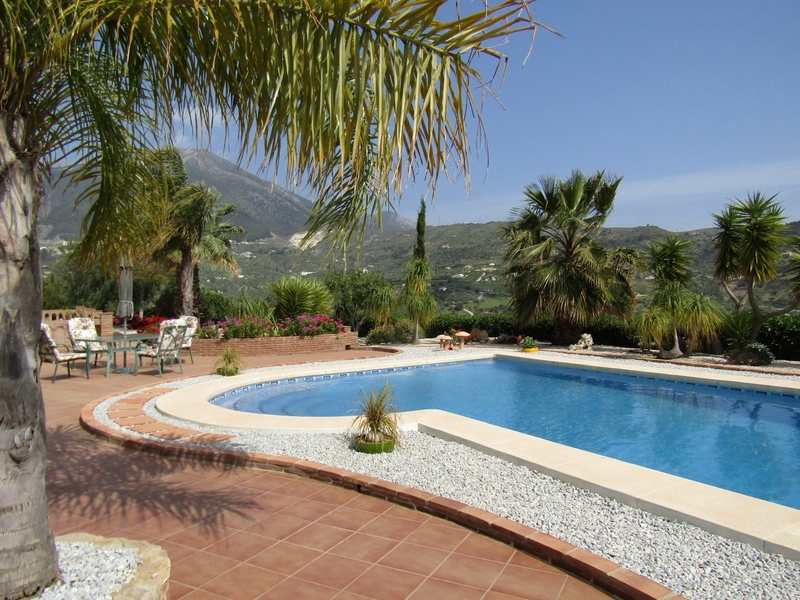 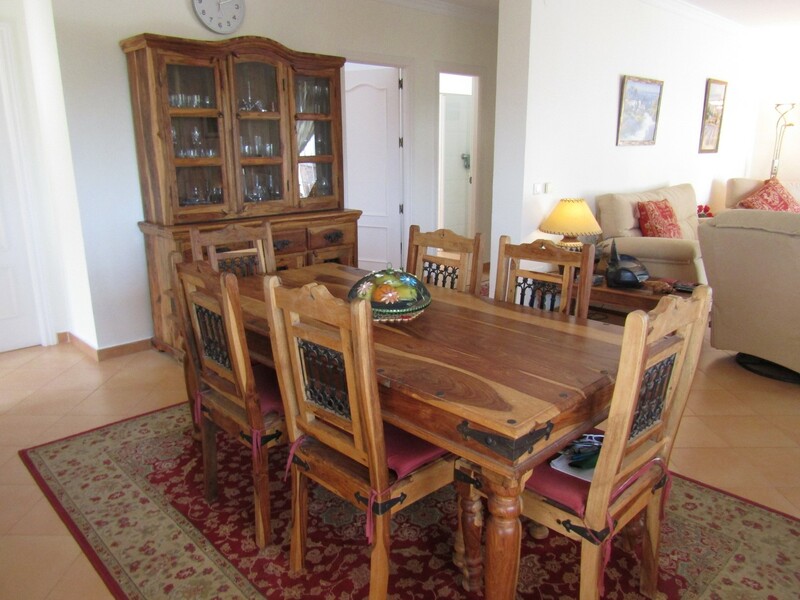 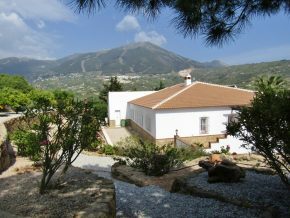 This striking country house is set in glorious countryside only 5 minutes from the local facilities at Puente Don Manuel/Venta Baja, 25 minutes to the coast, and under 1 hour from Malaga city and airport. The short country lane (mostly asphalt/concrete with a short, very good dirt track approach to the house), leads to a number of well established villas in mature gardens, and on into the open countryside. 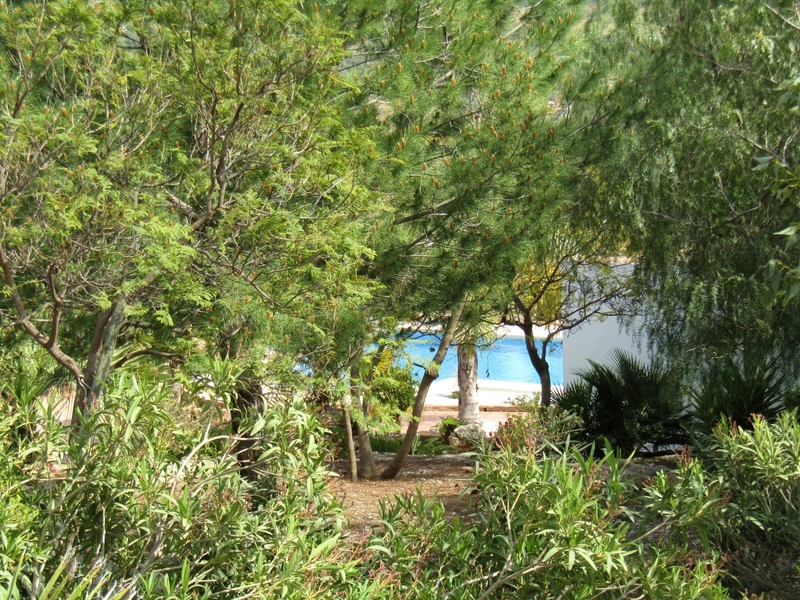 Casa Sierra Vista, whilst not far from other houses, is very private, not overlooked, with no other houses in sight. 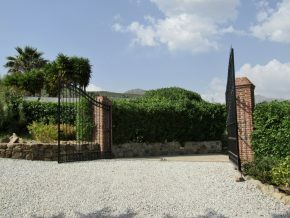 The gated gravel drive leads past flowering bushes and shrubs and mature palm trees to a large parking area. 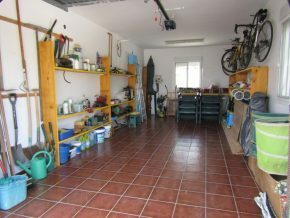 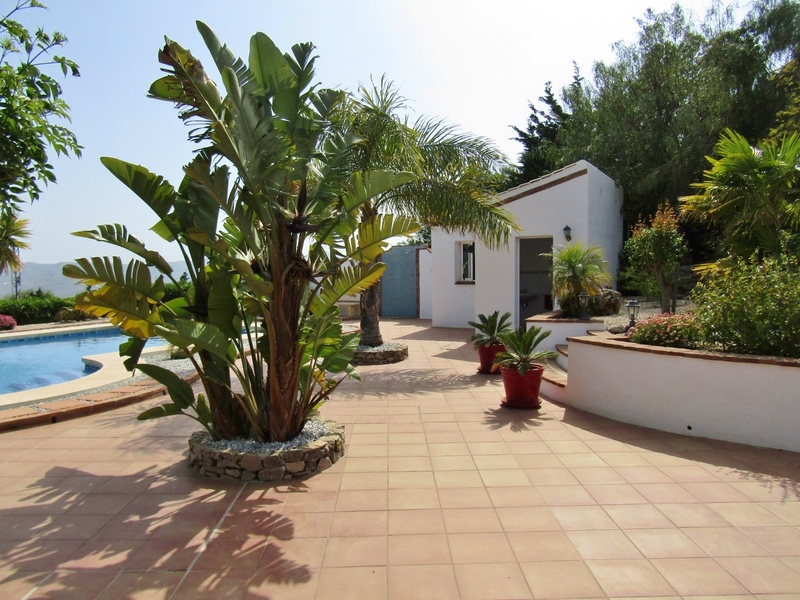 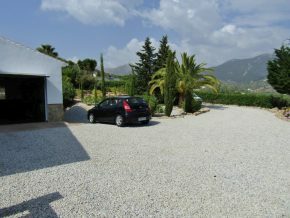 From here is access to the large garage with electric door (8.2 x 3.8m) and on, to the house and front covered terrace. 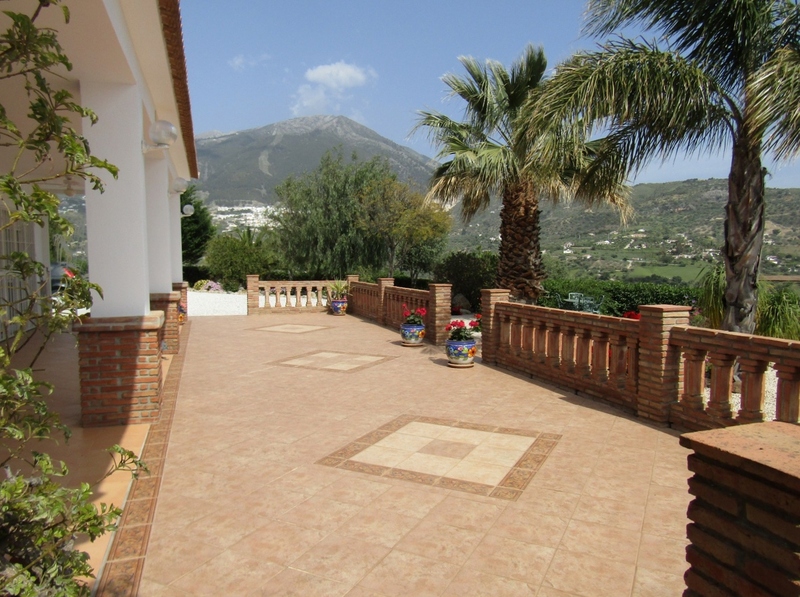 The house, around 150m2 and South facing, has a beautiful covered terrace (another 30m2) with side glass panel for maximum protection from the weather and it overlooks very attractive, perfectly maintained gardens, the pool, just nicely set away and to one side of the main house, and the lovely country and mountain views all around. 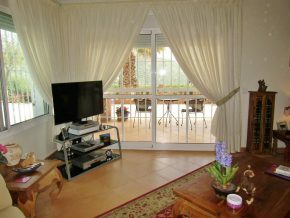 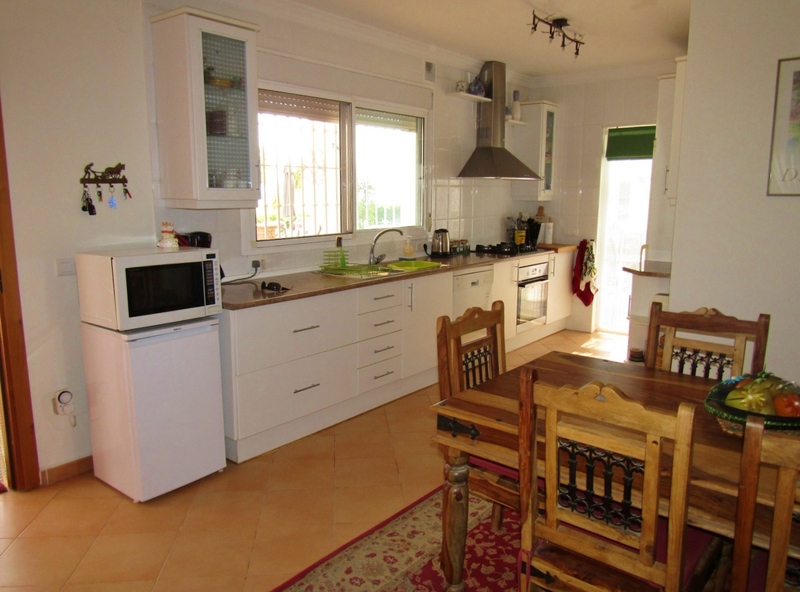 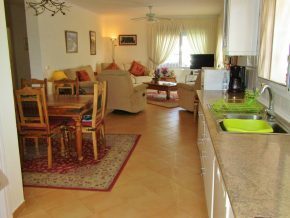 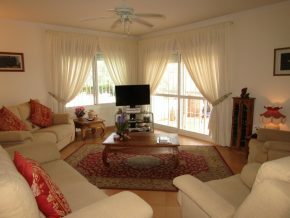 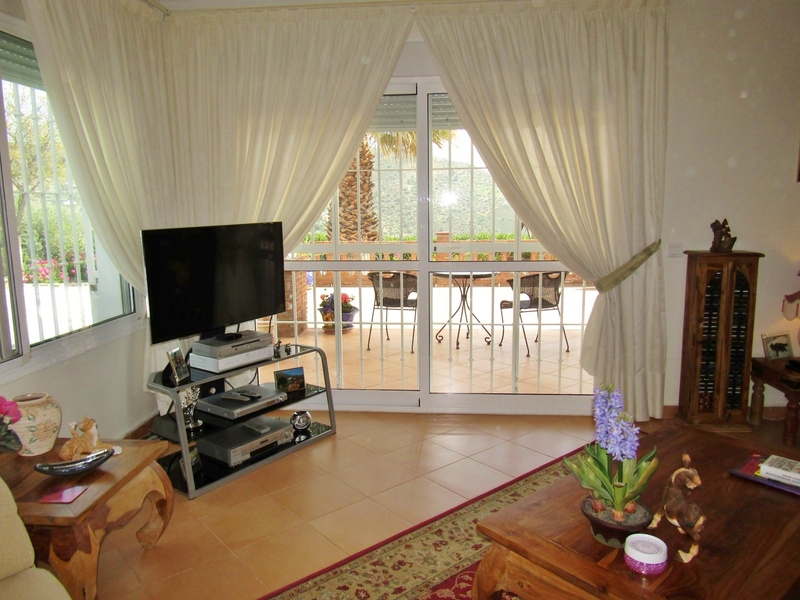 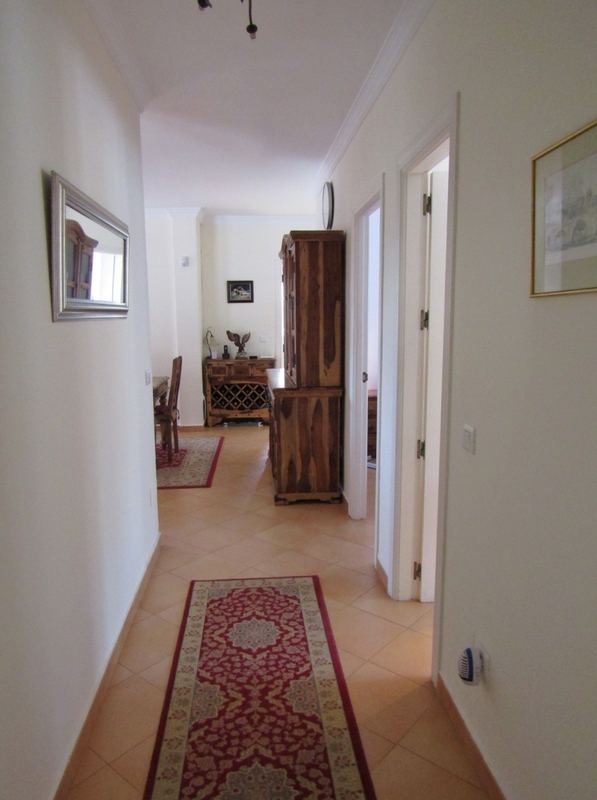 The front door leads into a large, open plan kitchen/dining/living area. 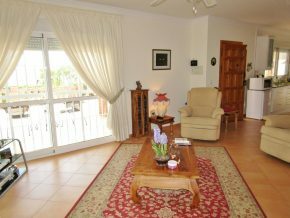 To the right is the main living area, with plenty of light coming in from the large, modern windows and glass sliding patio doors. 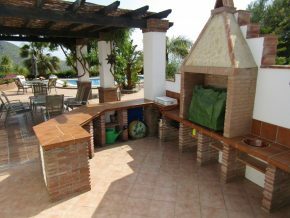 To the left is the fully fitted, modern kitchen, with a door to the side pergola, barbeque terrace, and in the centre is the dining area. 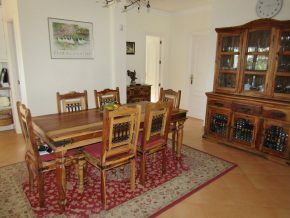 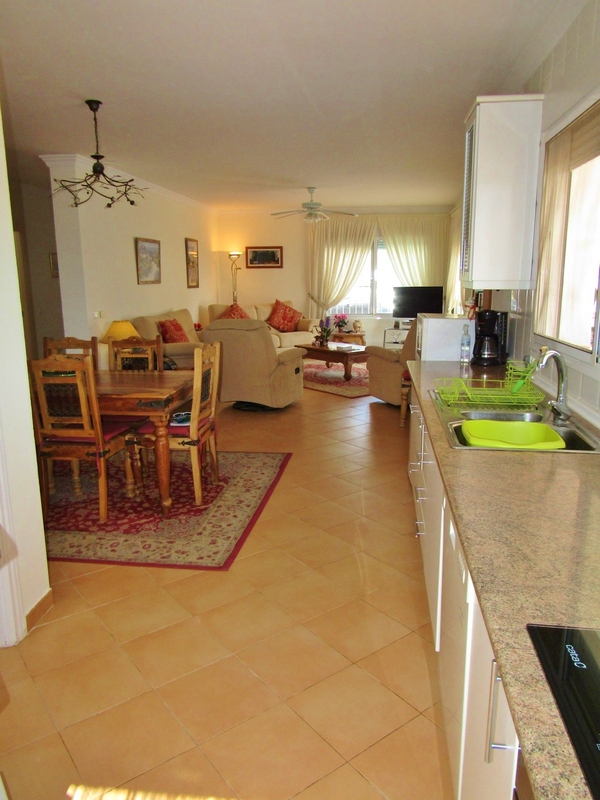 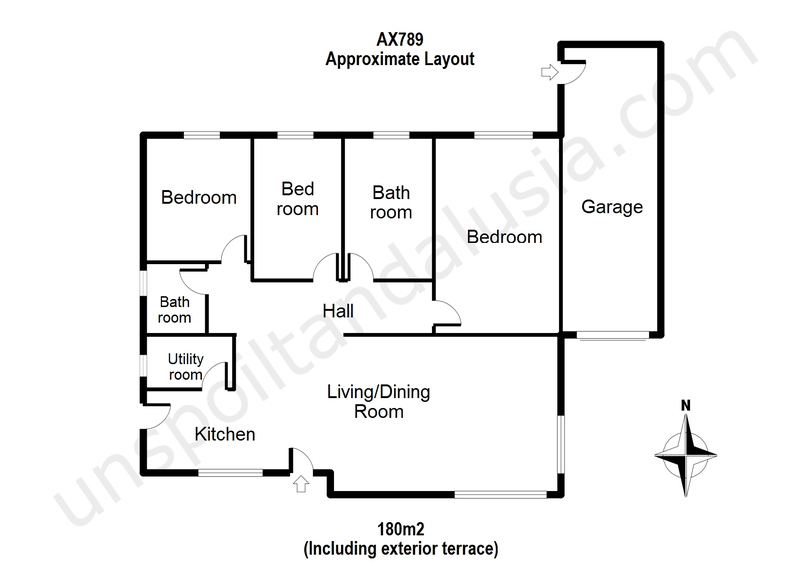 The living/dining area is around 8 x 4.5m and the kitchen 4.5 x 2.25m. 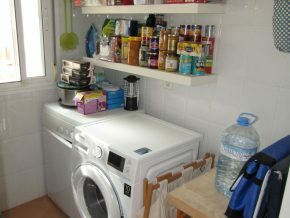 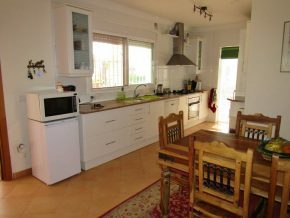 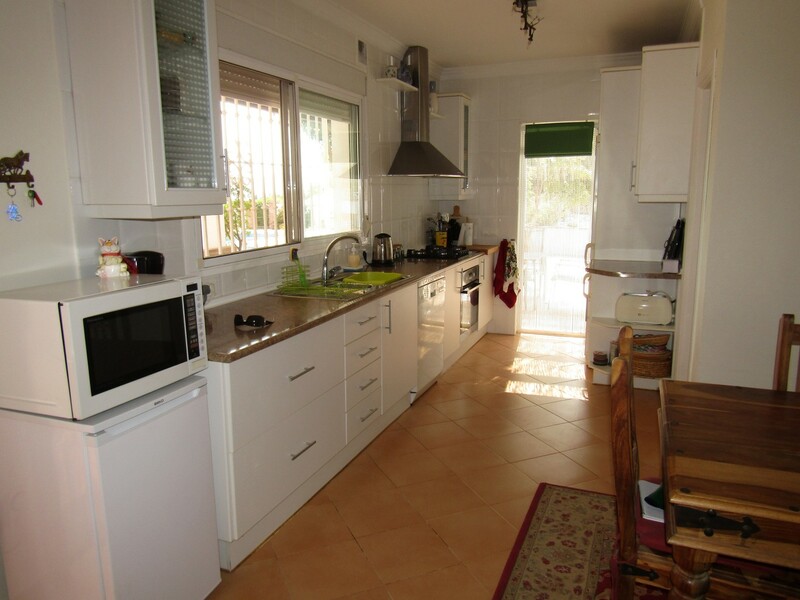 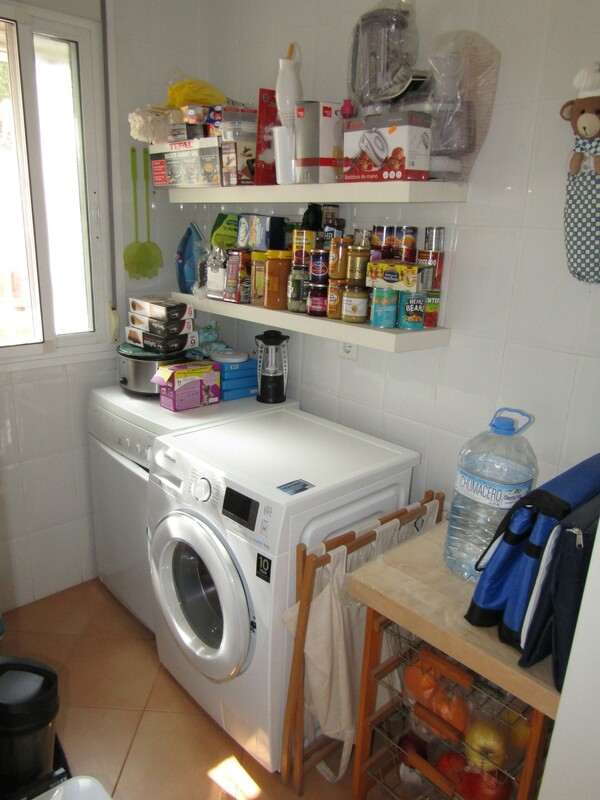 The kitchen also has a useful utility room of around 2 x 1.5m, with washing machine and dryer – ideal to store away anything one does not wish to be visible in the open plan kitchen area. 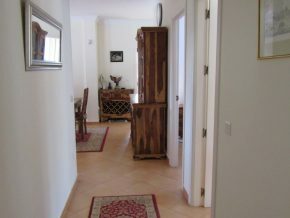 From the rear of the dining room is a lobby area from which the bedrooms and bathrooms can be accessed. 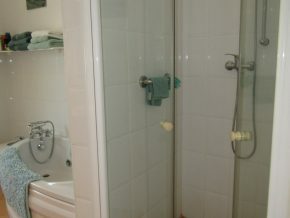 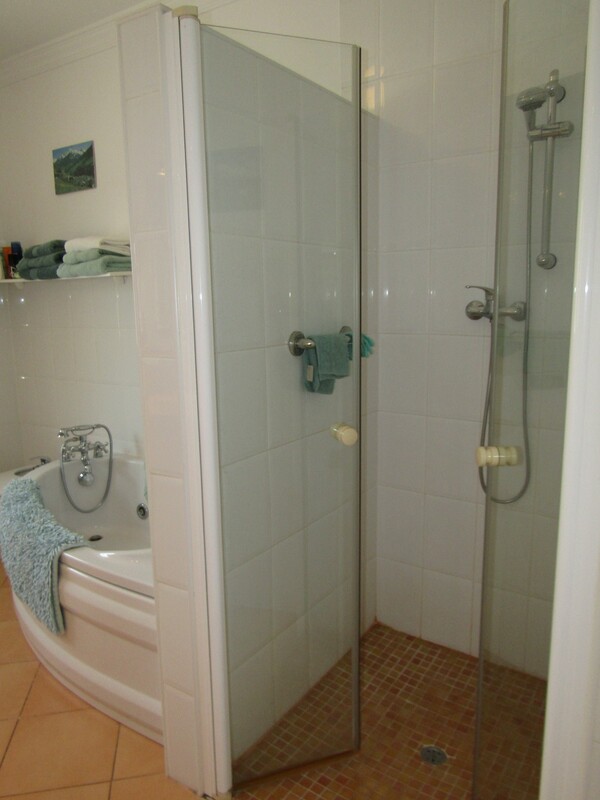 To the far left is the shower room (1.8 x 2m) with corner shower unit, and next to this room is bedroom 1 (3 x 3.2) with a window to the rear of the property and built in wardrobes. 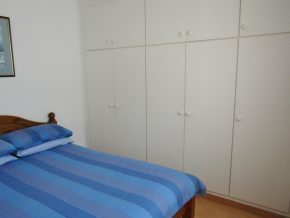 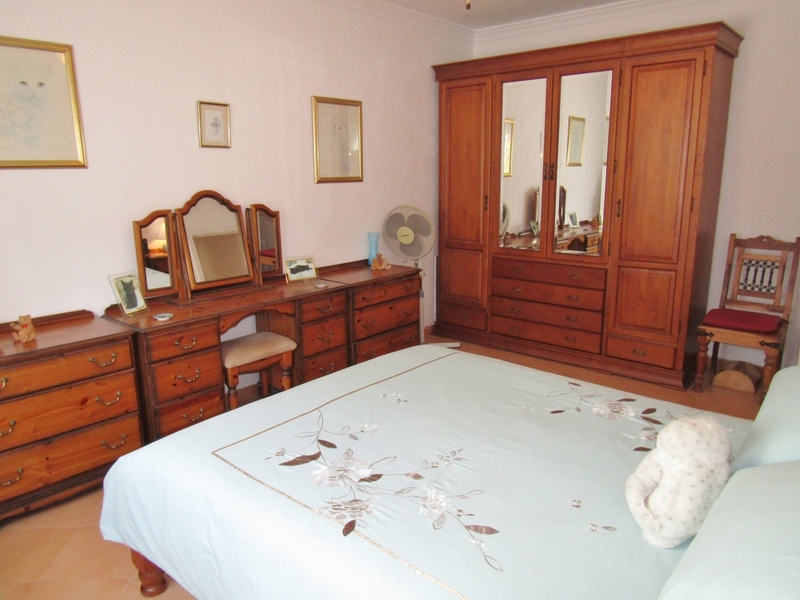 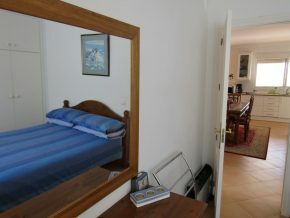 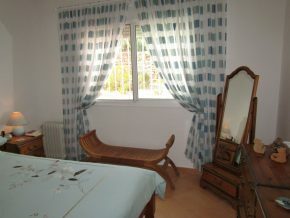 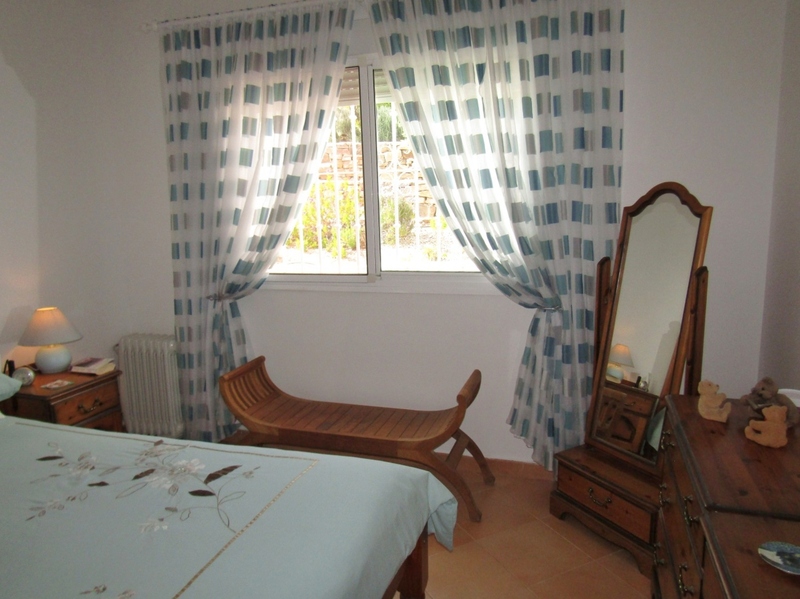 Further along is the second bedroom (3.5 x 3m) also with built-in wardrobes and window to the rear. 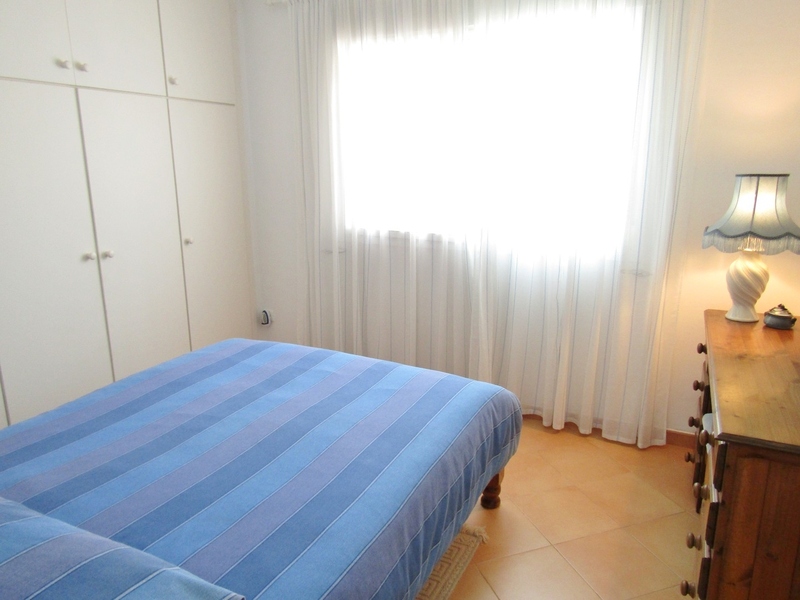 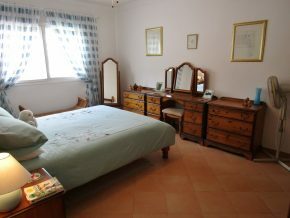 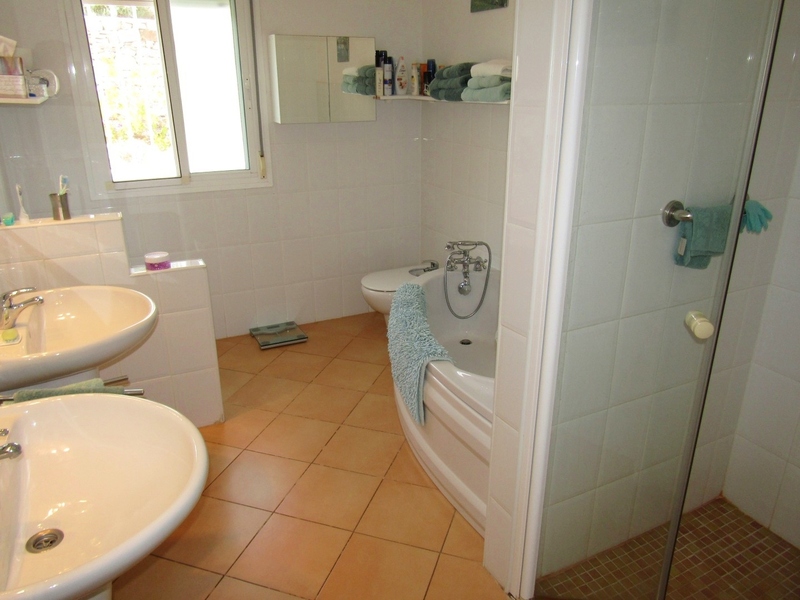 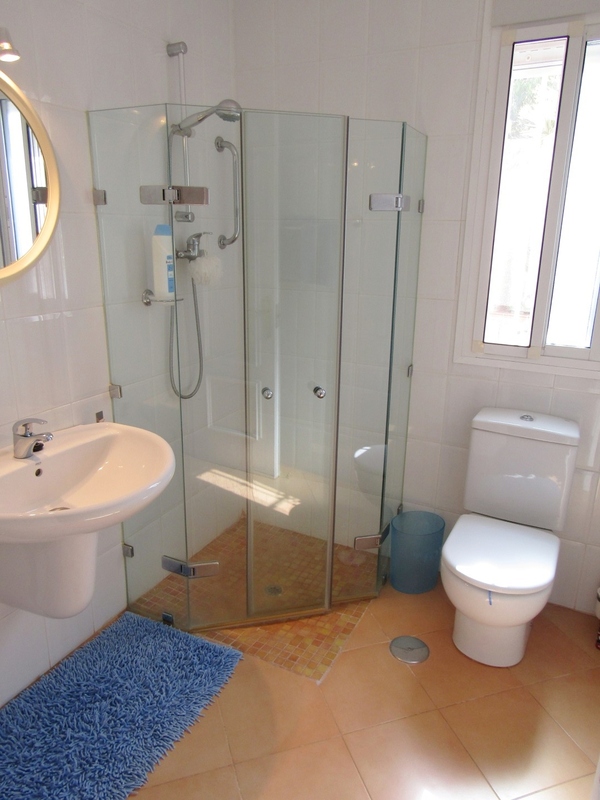 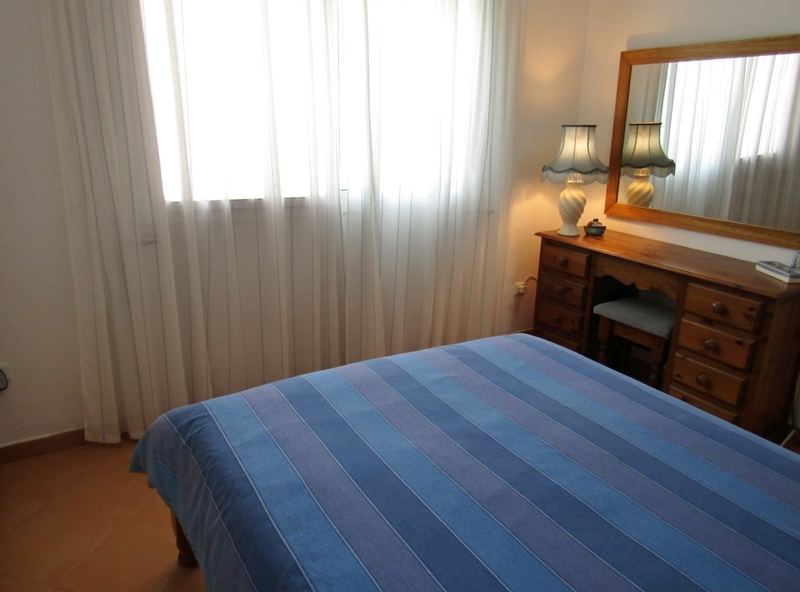 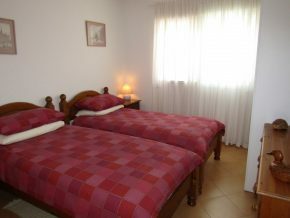 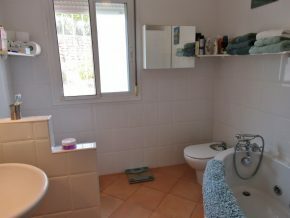 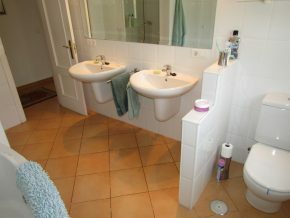 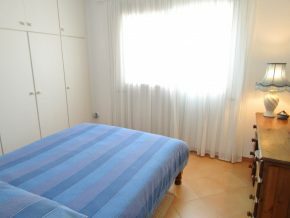 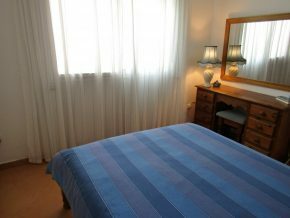 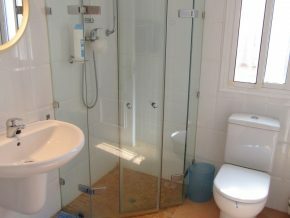 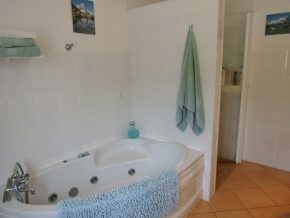 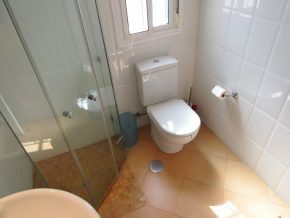 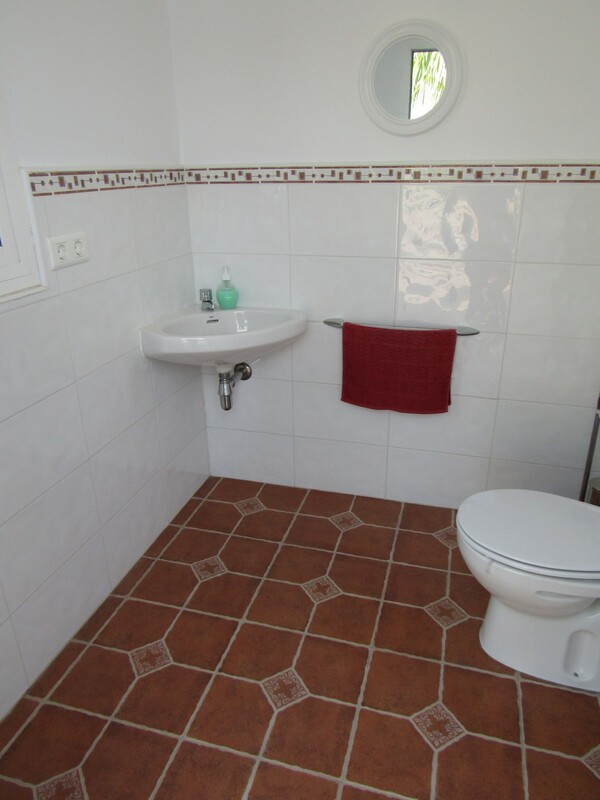 To the right of this room, along a short corridor, is the main bathroom (3.5 x 2.5m) with twin wash basins, bidet, jacuzzi bath and separate walk-in shower unit, and window to the rear, and next door is access to the third bedroom, used as the master bedroom (4.9 x 3.5m) with window to the rear. 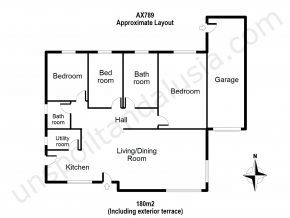 As this is a larger room, and beyond it is the garage, it would be very easy to either add an ensuite bathroom to the master bedroom, only sacrificing a small area to the rear of the garage. Alternatively, if a garage is less of a priority, a short corridor could be created through the current master bedroom, leading into the garage, which could be converted into one large fourth bedroom with a third bathroom. 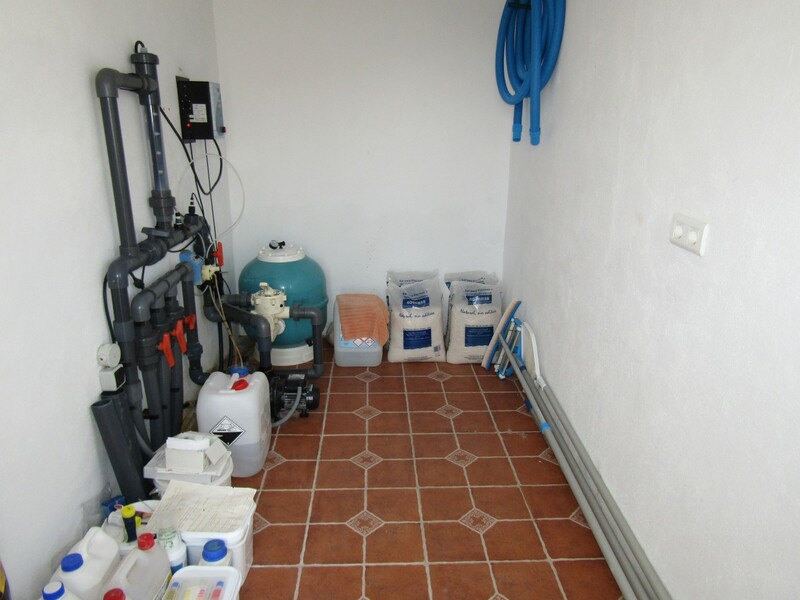 The entire house is made comfortable in Winter using a system of electric heated underfloor hot water pipes, and in Summer the same system can cool the water pipes, cooling the entire house. The domestic water is solar powered with automatic electric back-up. 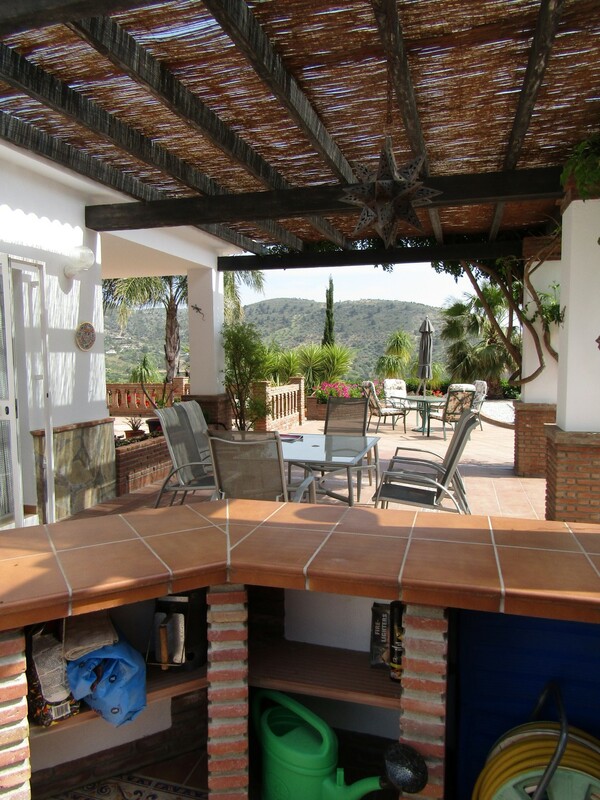 Outside, to the West of the house, the pergola terrace (with door to kitchen) is a large, cool area with pretty, dappled shade and an ideal place for dining out. 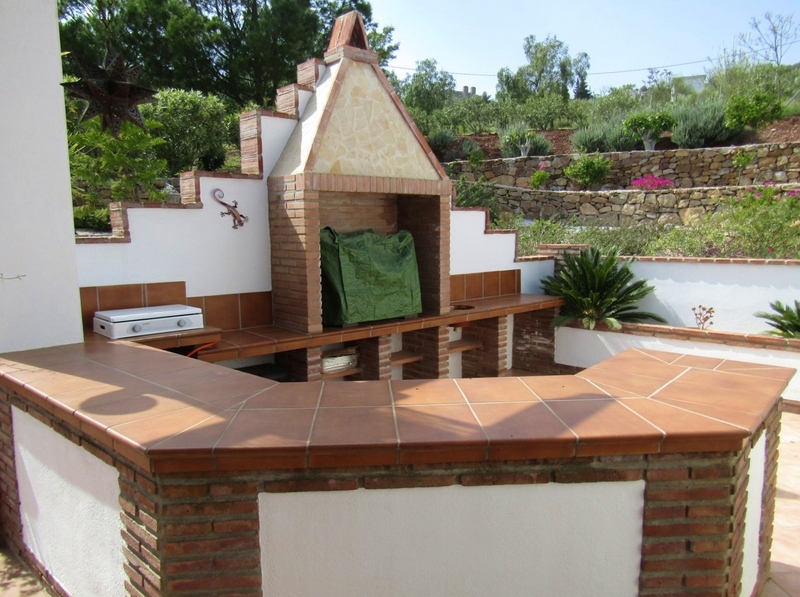 Here, there is also a built-in barbeque and outside kitchen area. The gardens continue on to a magnificent pool area. 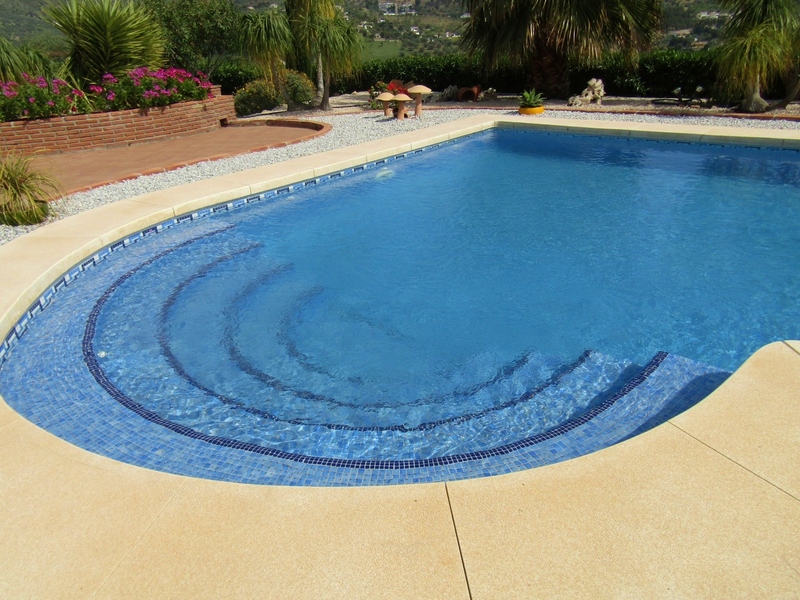 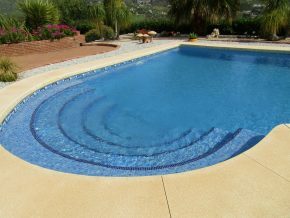 The stunning, salt water pool is 9 x 4.5m plus a wide, semi-circular area with steps leading down into the water. 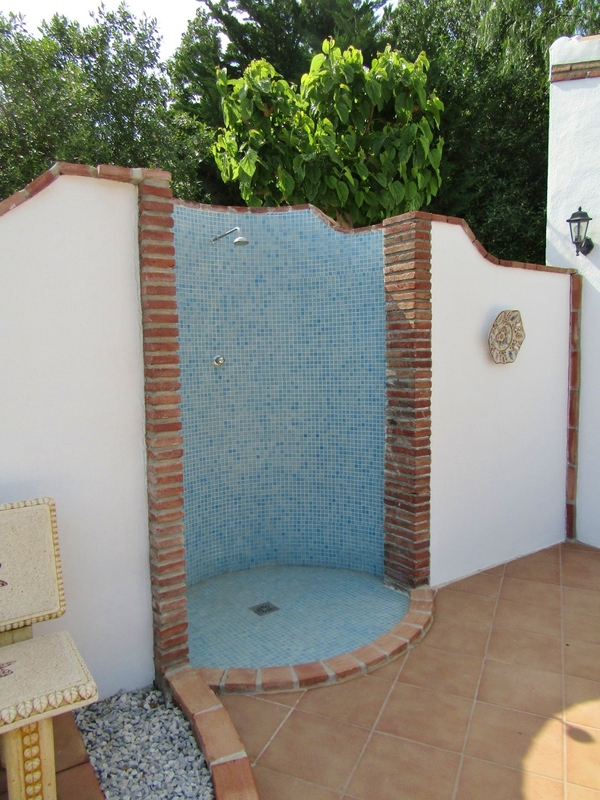 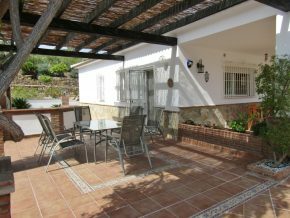 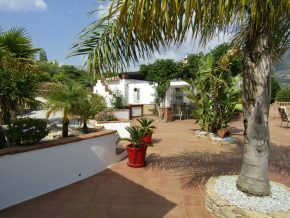 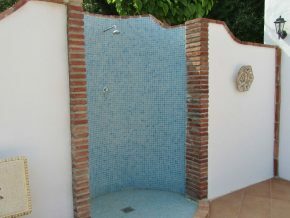 The terrace area around it is tiled and ideal for sunbathing in total privacy and there is a large built-in outside shower. 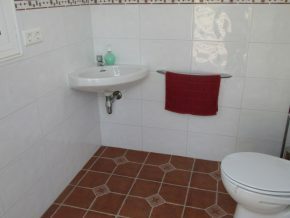 There is a pool room with easy access to the pool equipment and also useful as a roomy store room, plus an additional room which is the outside bathroom and changing room. 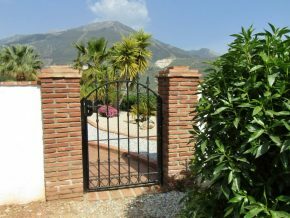 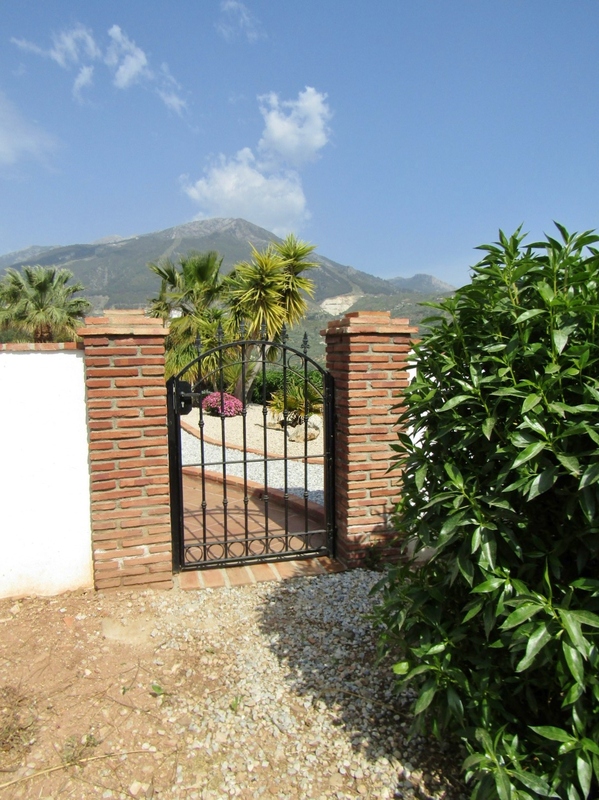 Beyond the pool area, a gate leads to the area of land that is still as nature intended it! 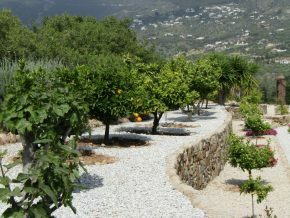 Here, is a beautiful area ideal for anyone wishing to experiment with growing fruit trees, vegetables, even keeping chickens and maybe a horse. 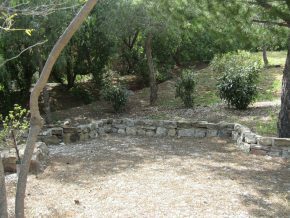 It is fully fenced and there is a separate gated entrance from the road for this area. 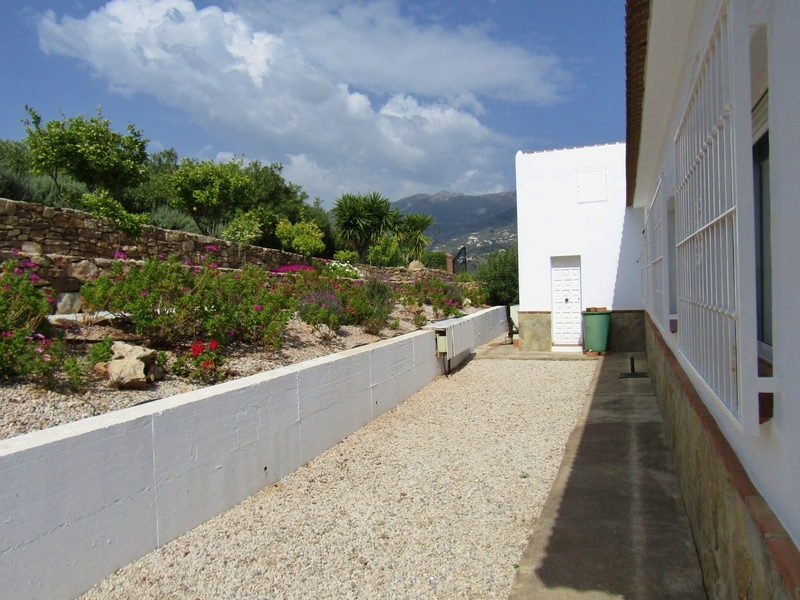 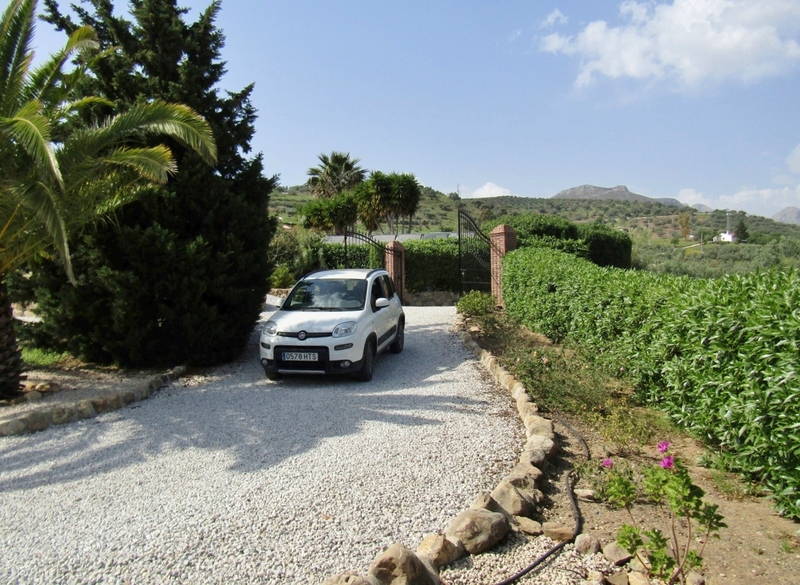 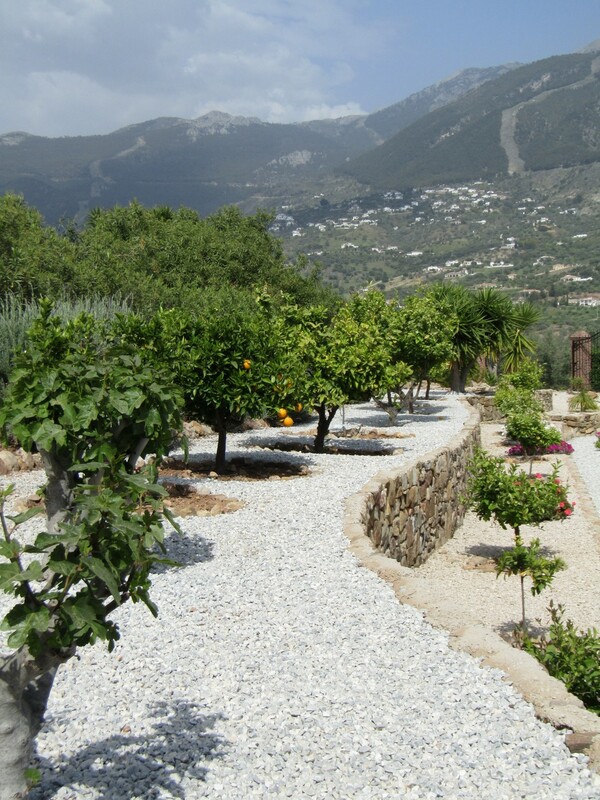 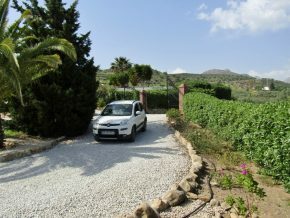 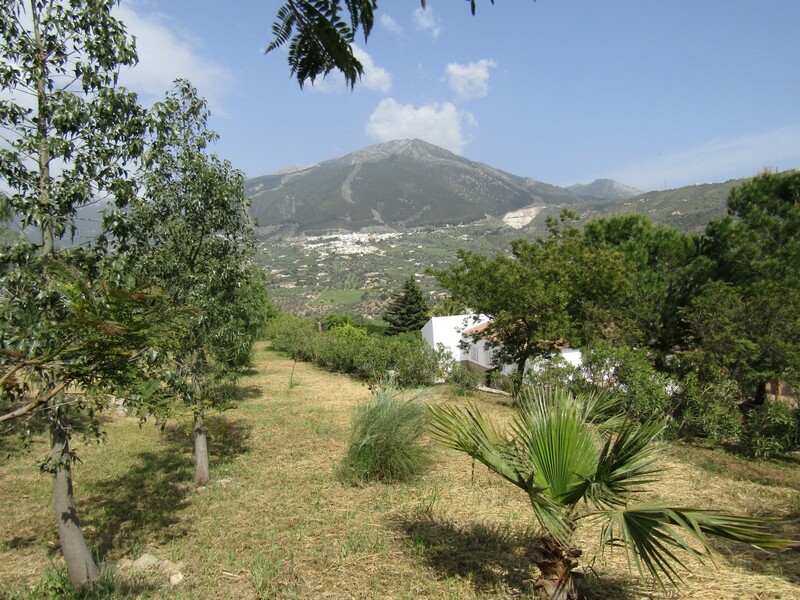 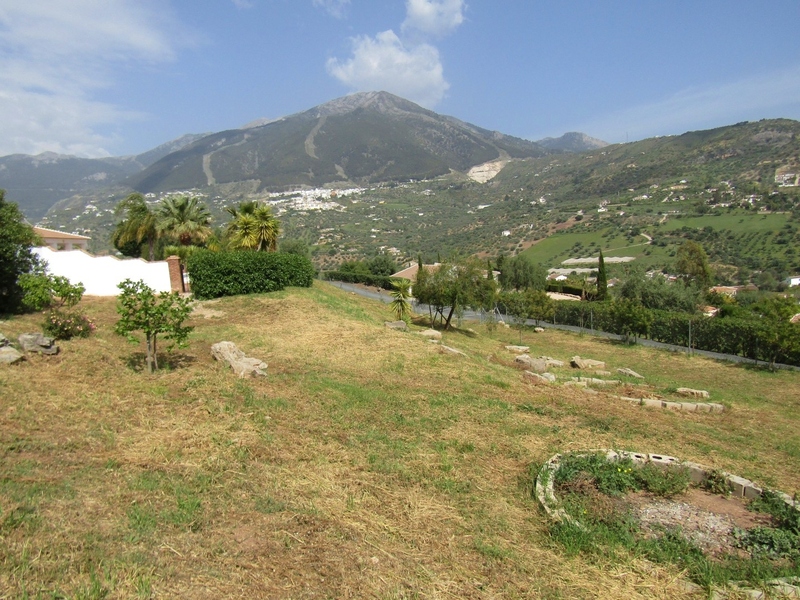 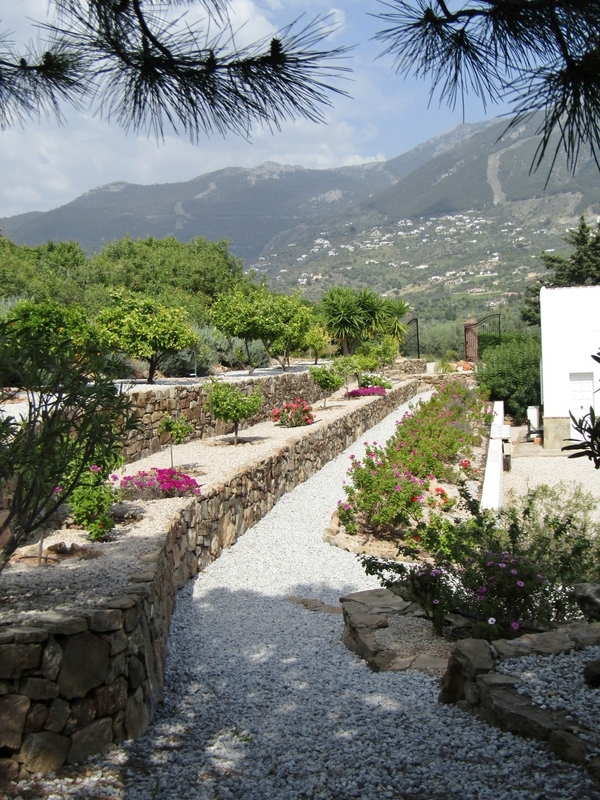 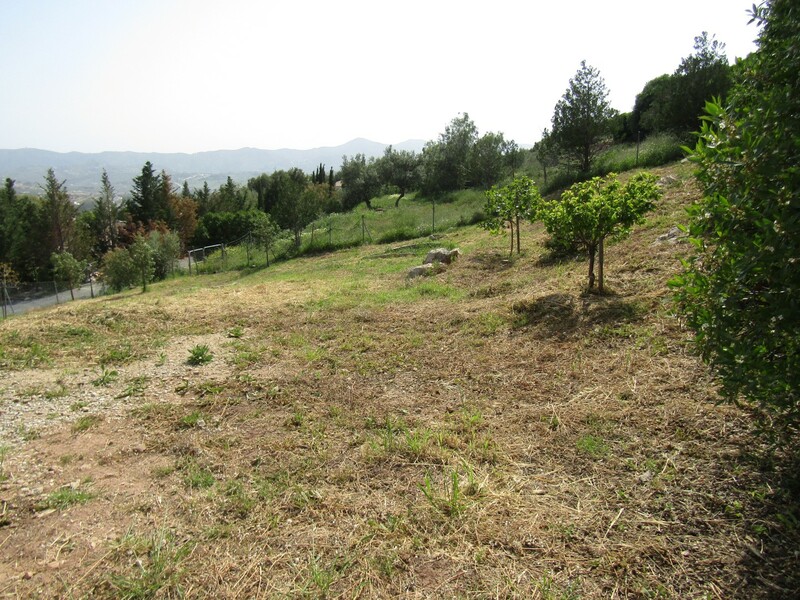 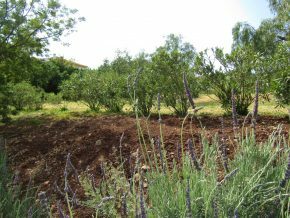 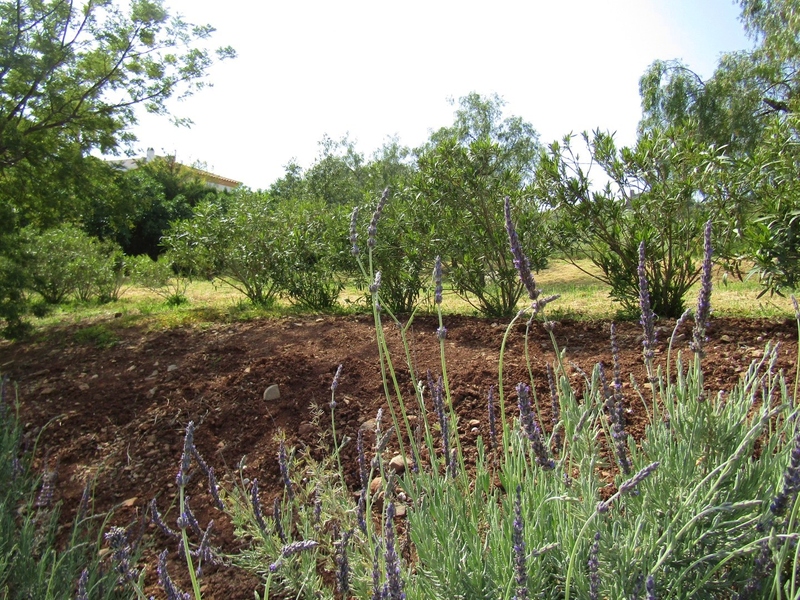 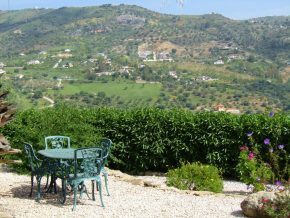 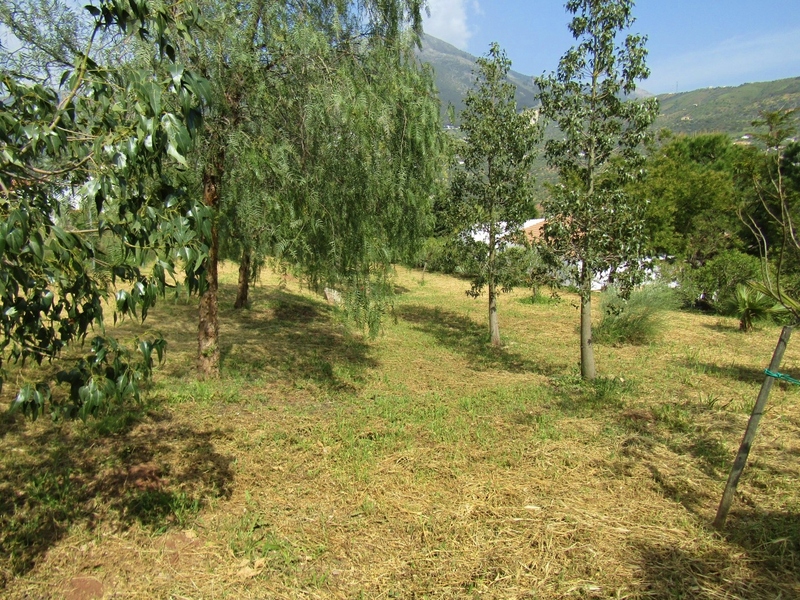 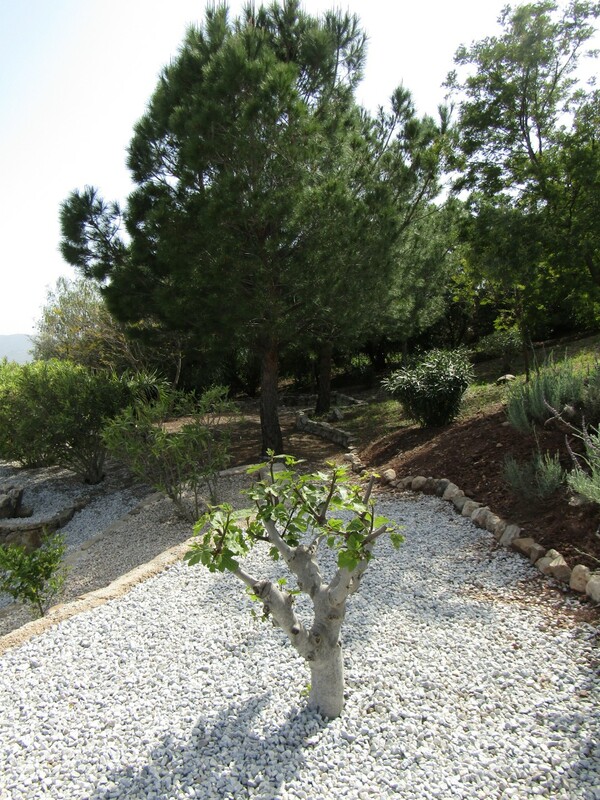 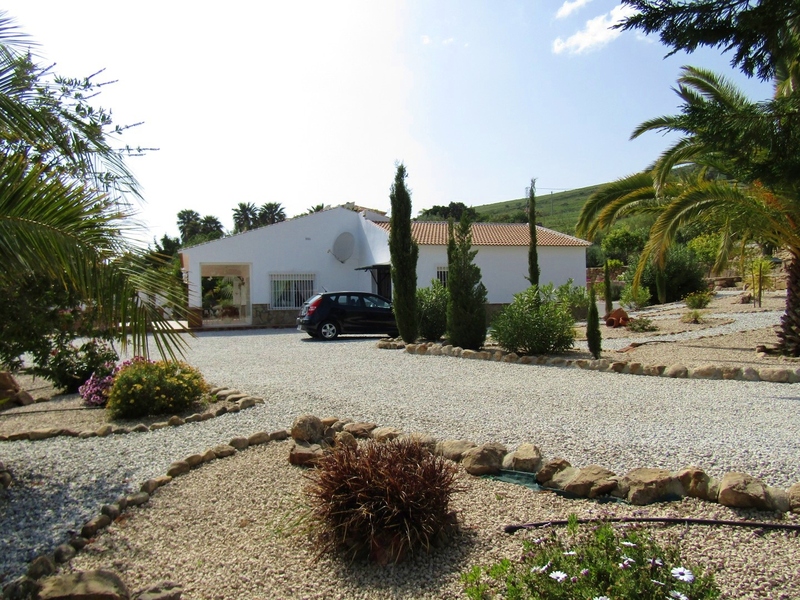 Behind the house, the land slopes gently uphill and is exquisitely landscaped with terraces and stone walls planted with a number of fruit trees, including lemon, lime, different types of orange trees, tangerine, fig, nispero, caqui and apricot. 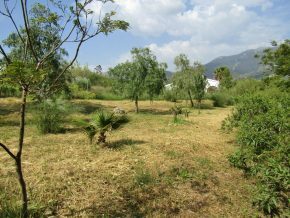 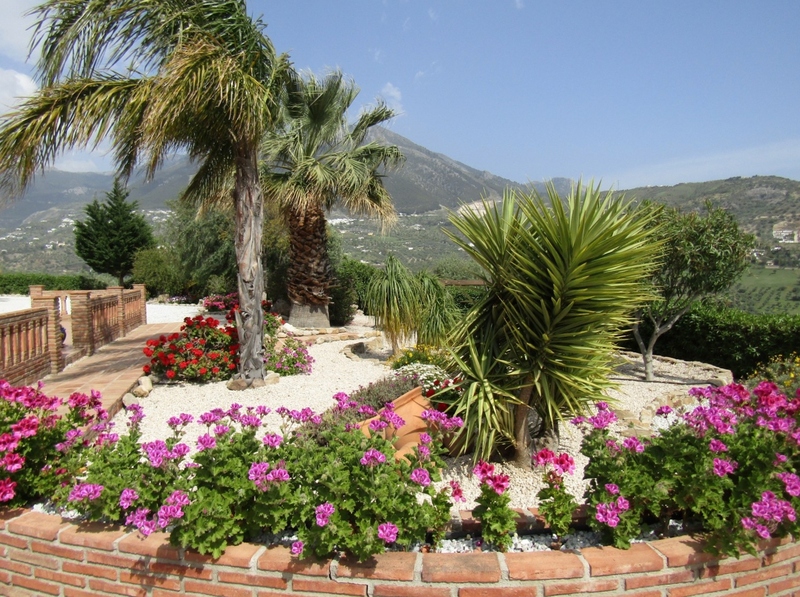 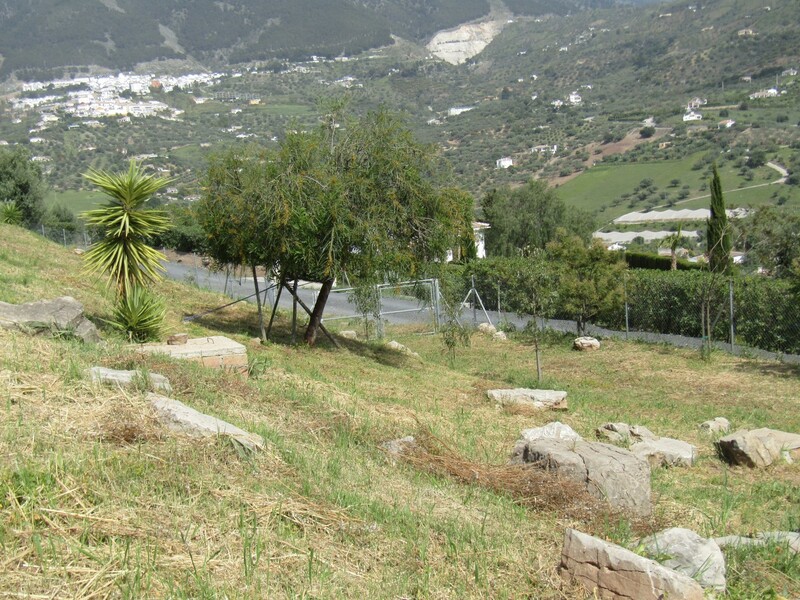 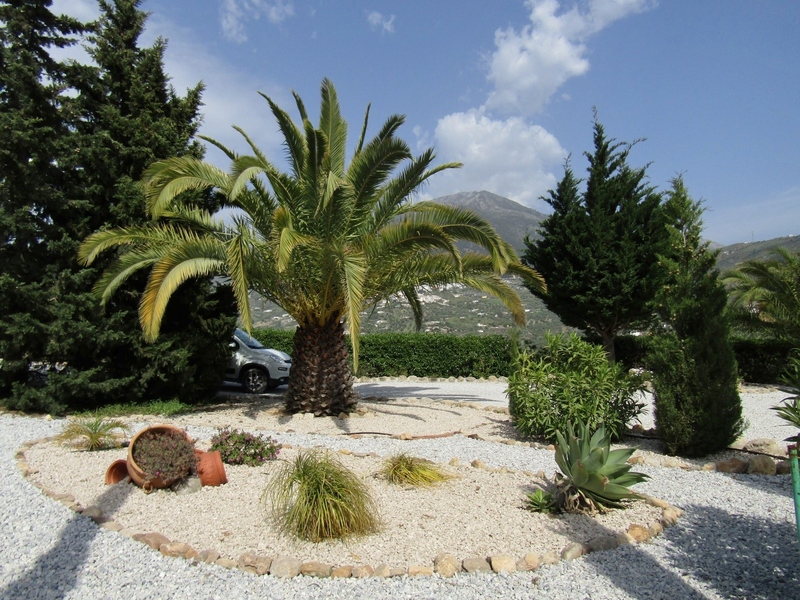 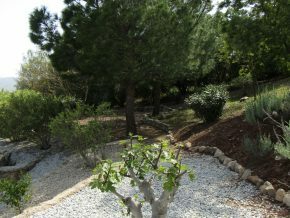 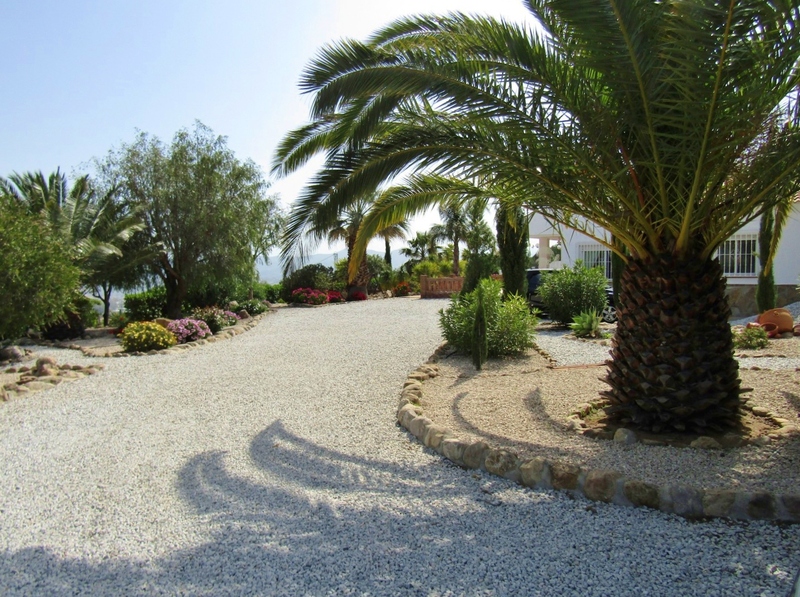 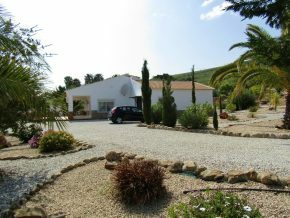 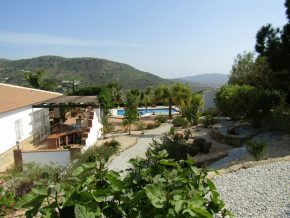 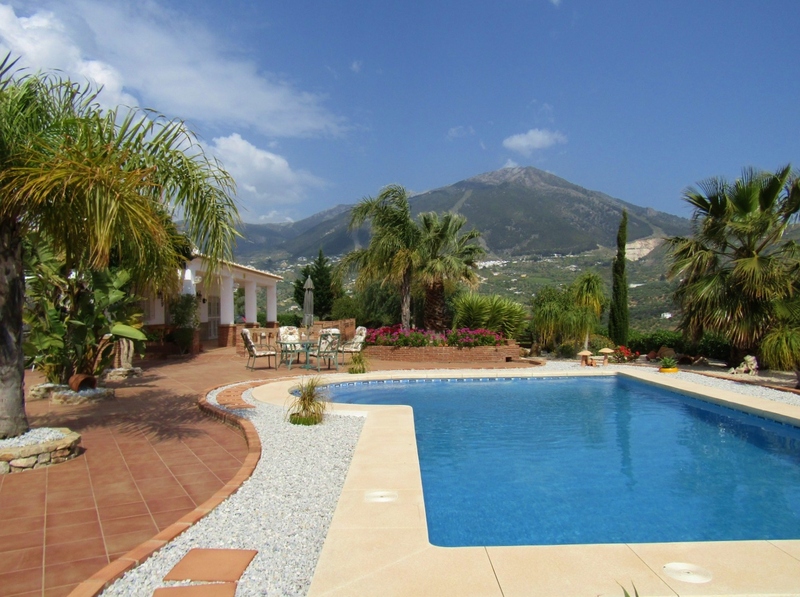 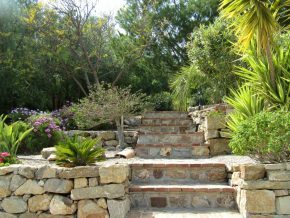 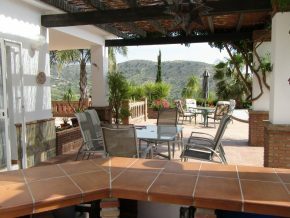 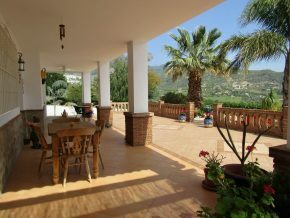 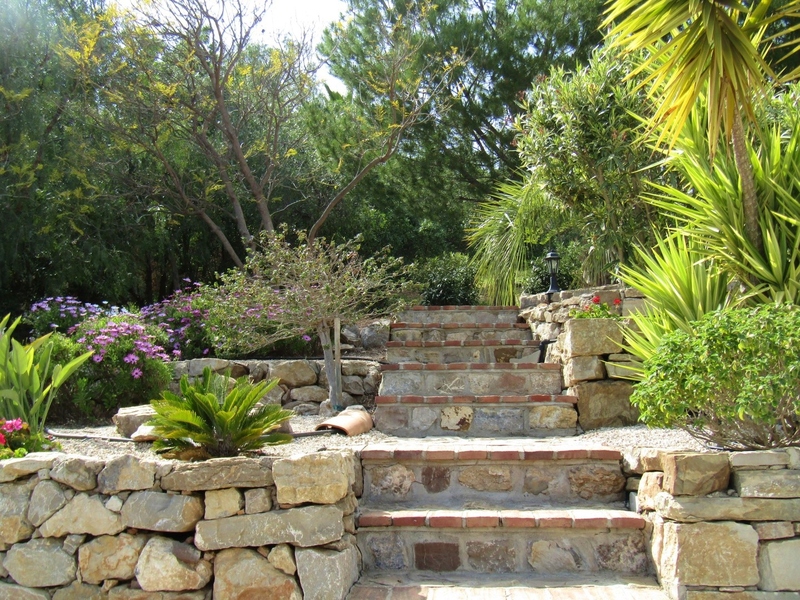 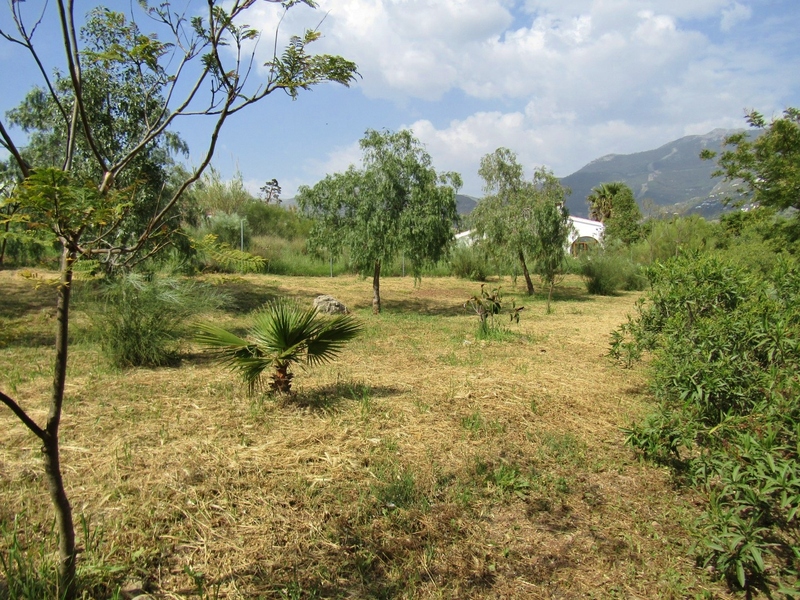 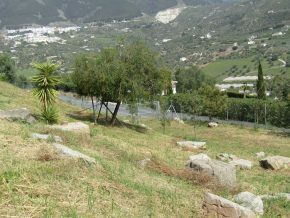 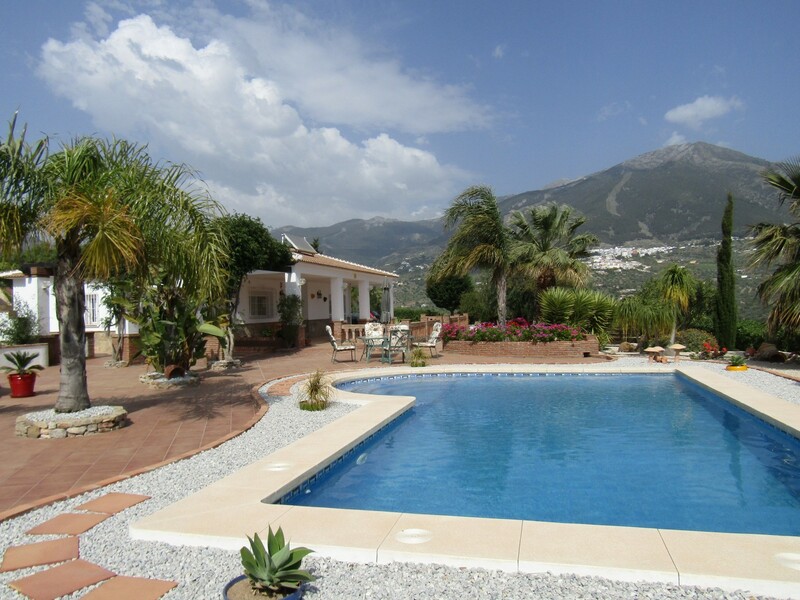 There are shady areas with mature palms, firs, olives and pine trees, creating a feeling of nature, serenity and tranquility, with plenty of natural shade, and the views from the top corner of the plot are beautiful, looking down over the entire property, the countryside and the magnificent Sierra de Tejeda mountain range and in particular, the imposing Mount Maroma, the highest mountain in Malaga province. 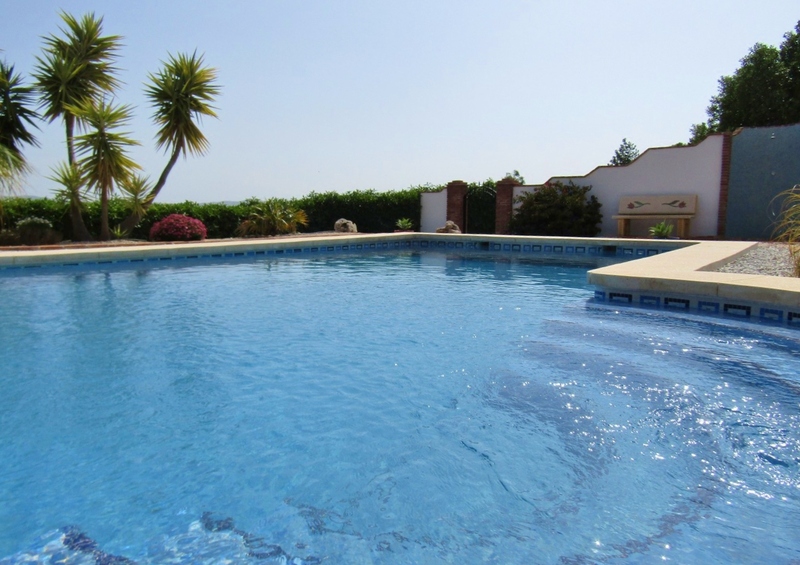 This magnificent property is ideal for anyone wishing to be in the countryside, but enjoy a comfortable house in a sophisticated, aesthetically pleasing environment, with an established garden with mature trees, and the added benefit of a bit of virgin land too! 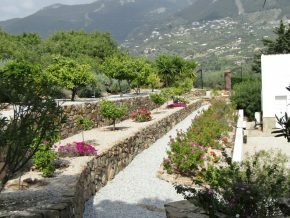 – Extra land ideal for a kitchen garden, horse, chickens, etc. – Council tax/IBI 380€ p.a.